There are 3 parts to this article on feng shui bed placement and bedroom solutions. Part 3 is divided into sections A to H. You are now reading section C of part 3. Why are beams or any heavy items above the bed bad feng shui? 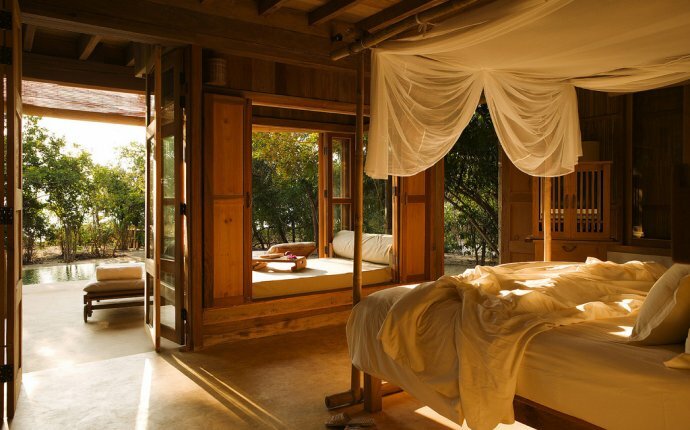 The only thing you want above your bed when you sleep is a soft canopy. That's about it. Nothing heavy, nothing hanging, please do not hang wind chimes and bells above your head, this is bad feng shui. Anything heavier than a piece of fabric above your bed will create oppressive/heavy energy which will, sooner or later, manifest in your daily life. What exactly do you mean by "any heavy item above the bed"? Most often this will be either a beam, a ceiling fan, or a chandelier (hopefully not all of them together!) above the bed. However, sometimes I even see a heavy metal wind chime over the bed as an attempt for good feng shui. If you are contemplating hanging a chime over your bed, don't. Unless, of course, you are longing for some really bad feng shui in your bedroom! How can I remedy the situation with a beam, a ceiling fan or a chandelier over the bed? If you have a heavy beam above your bed, no matter if it is right above you when you sleep, above your partner or in between the two of you - this is bad feng shui. Best feng shui solution is to move the bed away from the beam. If you cannot move the bed, buy a canopy bed or create a canopy over your existing bed in order to protect your health and your relationship from heavy energies. If you have a fancy looking chandelier - yes, I know they can look very pretty in the bedroom! - hang the chandelier further away from your headboard. The same feng shui rule applies to the ceiling fan. This might take a bit of effort and a call to the electrician, but it is absolutely worth it. If you are renting, the easiest feng shui solution for any heavy items above your bed is to create a canopy. You can find a variety of beautiful fabrics to go with your decor scheme. Choose some strong, ideally natural fabric for your canopy, such as linen, for example. A soft, transparent fabric will not work, feng shui-wise, because you need good energetic protection here. Painting the beams in a light color - most often in the same white color of the ceiling - before you create the canopy above the bed is also an excellent feng shui solution. Unless, of course, you can move the bed away from the beam or choose a different room altogether for your bedroom! From the best positioning of the bed to the most practical feng shui solutions for your bedroom, it is all here, in this feng shui bedroom article. @Jason Bailey: DYK: In feng shui, the ideal bed location is diagonally opposite the door.